Can you feel the Force? Do you want to battle evil in a galaxy far, far away? Are you on the side of light, or do you look really good in black? 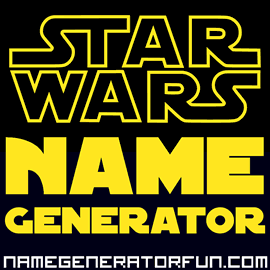 Whichever side you choose, it's time to buckle up and embrace your ultimate destiny with the Star Wars name generator! George Lucas named the characters in the original Star Wars trilogy by steering away from science fictional words and instead trying to create ones that sounded indigenous and had a sense of some kind of culture. Darth Vader's name actually has its roots in Dutch (meaning 'Dark Father'), while other names tapped strongly into mythology – the name 'Anakin' was developed from a race of giants mentioned in the Bible book of Genesis, while 'Skywalker' is a phrase often used to describe Loki in Norse mythology, and 'Luke' means 'light' in Greek, and has direct connections to the Christian saint. The name Chewbacca was inspired by Lucas's dog Indiana, while the Wookie race was named after an ad-libbed line from Lucas's first movie THX-1138. Boba Fett was intended as a reference to Bob Falfa, the drag racer played by Harrison Ford in Lucas's second movie American Graffiti, while that film also gave inspiration for heroic robot R2-D2, when the movie's sound editor used shorthand to refer to 'Reel Two, Dialogue Two" during the post-production process. Some minor Star Wars characters also have unexpected sources for their identities – like President of the Commerce Guild Shu Mai (in Attack of the Clones and Revenge of the Sith) who's named after a traditional pork dumpling; criminal Cikatro Vizago in Star Wars Rebels, whose name is actually Esperanto for 'Scar Face'; or fighter pilot Ello Asty (in The Force Awakens) who's named after the Beastie Boys album Hello Nasty. (Another member of Ello's race is Slowen Lo, featured in The Last Jedi, who is named after a Beastie Boys track called 'Slow and Low'.) Others are classic sci-fi references, like Klaatu and Barada, two Nikto henchmen of Jabba the Hutt in Return of the Jedi, who are named after the phrase 'Klaatu Barada Nikto' from the 1951 movie The Day the Earth Stood Still. Disclaimer: This is a fan commentary page intended to encourage interest in Star Wars. Our page is not an official publication and is not in any way affiliated with or endorsed by Star Wars, Lucasfilm, Disney, or any of their licensees. Copyrights and trademarks for the films, TV series, and any other materials are held by their respective owners and reference to them is allowed under the fair use clause of copyright law. This page is in no way intended to harm or undermine the market value of Star Wars, Lucasfilm or Disney, rather to encourage fans to engage with and seek out works set in the Star Wars universe.